(TibetanReview.net, Nov08, 2016) – China said Nov 6 that it had sent a batch of some 20 Tibetan Buddhist leaders, described by it as recently incarnated ‘living Buddhas’, on a patriotic education trip to communist landmarks and other sites in China over Oct 20-28. The trip was organized “after the Living Buddhas learnt about national religious policies and socialist core values at the Tibetan Institute of Socialism,” reported China’s international party mouthpiece globaltimes.cn Nov 6. The purpose of it all was “to guide our religion to fit the socialist society”. At the end of the session ‘Living Buddhas’ vowed allegiance to the Chinese central government, according to Tibet.cn, a major news portal of Tibet autonomous Region (TAR), on Nov 5. “I feel that our country is wealthy and powerful. It’s a socialist new China built by numerous martyrs,” living Buddha Jedrung (or Jizhong) from Chamdo was quoted as saying. This conclusion followed the visit of the “living Buddhas” to several revolutionary sites that included the Jinggangshan Revolutionary Martyrs Memorial Hall in Jinggangshan, East China’s Jiangxi Province and former residences of Mao Zedong and Liu Shaoqi in Hunan Province. They also visited academies and companies including the National University of Defense Technology and construction machinery manufacturer Sany. The patriotic education programme was reported to have been jointly hosted by the United Front Work Department of the Communist Party of China Central Committee and the united front work department of TAR, an agency under the party that manages relations with non-party elites. 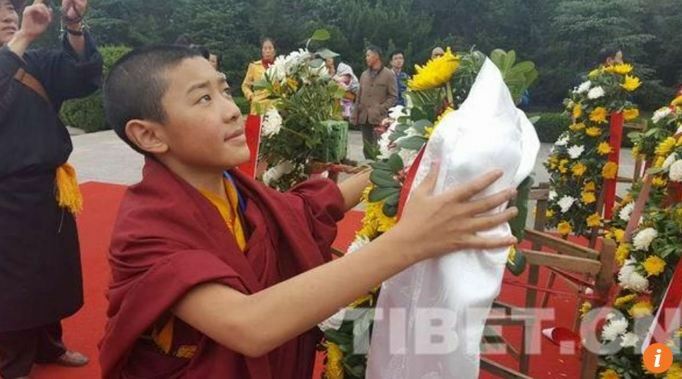 The report said the session was aimed at training some of the recently incarnated ‘living Buddhas’, with a picture showing fifth ‘living Buddha’ Dezhub Jambai Gaisanggyaco, born in 2005, shown offering a khata, a traditional Tibetan ceremonial scarf, to the bronze statue of atheist Mao in the former leader’s hometown. There are more than 1,000 ‘living Tibetan Buddhas’ on the mainland, according to Beijing’s controversial official online database, which was launched in Jan 2016. Such sessions had been held for Tibetan ‘living Buddhas’ before, and covered topics that included religion, ethnicity and political education, the Tibet.cn report said. Similar sessions have also been held for Christians, Taoists and Muslims on the mainland.